The US promised to hold Iran accountable for attacks on US facilities in Iraq. But does the US still have any power in the area? More than two weeks after the Trump administration announced it would keep its current force of between 7,000 and 9,000 US soldiers in Iraq and dispatched Brett McGurk, the presidential envoy for the global coalition against ISIS to Baghdad in order to prevent an Iranian takeover of the country, it is becoming increasingly clear the US is losing Iraq. On Thursday, pro-Iranian political factions finally reached an agreement about the forming of a new government, four months after May 12th's parliamentary elections. The forming of the new Iraqi government ended Trump’s hope of securing a second term of his ally Prime Minister Haider al-Abadi, whose Dawa Party or ‘Victory Coalition’ came third in the parliamentary elections. Al-Abadi, a pragmatic politician who maintained good relations with both Iran and the US, was blamed for a severe humanitarian crisis in southern Iraq where Iran suddenly cut off electricity earlier this summer and aggravated a severe water shortage during which over 60,000 people were poisoned when they drank contaminated water. As a result of the humanitarian crisis, thousands of Iraqis in Iraq’s largest southern city, Basra, took to the streets and torched the Iranian consulate but also cursed al-Abadi who visited the city earlier this week. At least 15 people died in the violent demonstrations which spread to other parts of Iraq, including its capital of Baghdad. The forming of the new pro-Iranian government came after Muqtada al-Sadr the controversial Shiite cleric who surprisingly won the May 12 election and Hadi al-Amiri, a Shiite extremist whose al-Fatah list maintains a close relationship with the Iranian Islamist regime, failed to register their own coalitions in the first session of the new Iraqi parliament. The two Iraqi leaders then decided to resume negotiations and held several meetings in al-Sadr’s residence in the city of Najaf. “We have reached preliminary understandings with Al-Sadr and are working to turn them into agreements under the umbrella of Marjiyaa (the highest Shiite clerics in Iraq),” Arab News quoted an al-Fatah official as saying. There were a couple of events which led to the forming of the pro-Iranian coalition in Iraq after the Americans tried to prevent it. First, Iran suddenly used the Iranian Revolutionary Guards Corps (IRGC) and the Iranian-founded Hashd al-Shaabi umbrella organization of predominantly Shiite militias in Iraq to stage attacks on American diplomatic missions and Kurdish bases in Iraq. The American embassy in Baghdad was attacked with mortar shells and the American consulate at the airport of Basra was attacked with missiles by Hashd al-Shaabi earlier this month. 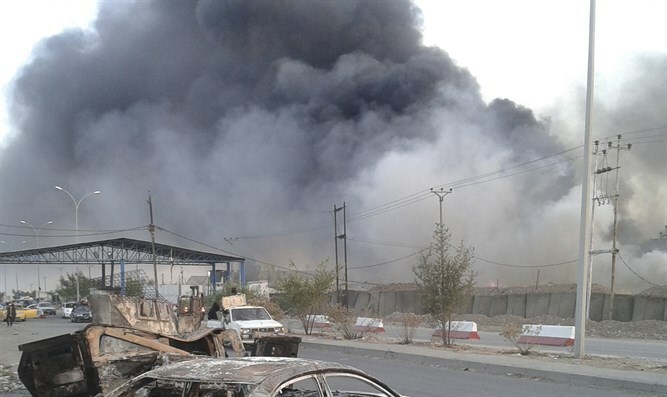 The IRGC also suddenly launched a missile attack on a Kurdish base and bombed the headquarters of the Kurdistan Democratic Party of Iran (KDPI) in northern Iraq from Iranian soil. At least 27 people died and 50 others were injured when Iranian ballistic missiles and artillery hit the Kurdish targets in northern Iraq. This was later followed by an Iranian invasion of the autonomous Kurdish region in northern Iraq. The Kurdish Peshmerga militia in northern Iraq reported that Iranian forces penetrated Iraq near the strategic Surin mountain in northern Iraq. The Iranians then set up camp on the top of the 2,000-meter-high mountain and brought missile launchers and artillery to Surin, using these weapons to target the KDPI headquarters. Iran later openly admitted that the attacks were meant as a signal to the Trump administration. Ali Shamkhani, secretary of Iran's Supreme National Security Council, said Iran would give “a response 10 times stronger than any hostile measure" by the United States and gave as an example the IRGC attack on the Kurdish base in northern Iraq. Another reason al-Sadr and al-Amiri suddenly decided to form a coalition without PM al-Abadi was a rare intervention by Iraq’s most important Shiite cleric, Grand Ayatollah Ali Al-Sistani, who on Monday issued a statement which said he would refuse the appointment for the post of prime minister of any politician who had previously exercised power. Some US politicians are now calling for sanctions against Iran’s proxies in Iraq while the White House warned the Islamic Republic it would hold the Islamist regime in Tehran accountable for any attack against US government facilities and military targets in Iraq. It remains to be seen, however, how the US military, with only a couple of thousand soldiers on the ground in Iraq, can stop the growing Iranian entrenchment in the country.